Home › BACON › Mega-Tomago! 185-Pounder! Yes, The World’s Craziest Burgers! 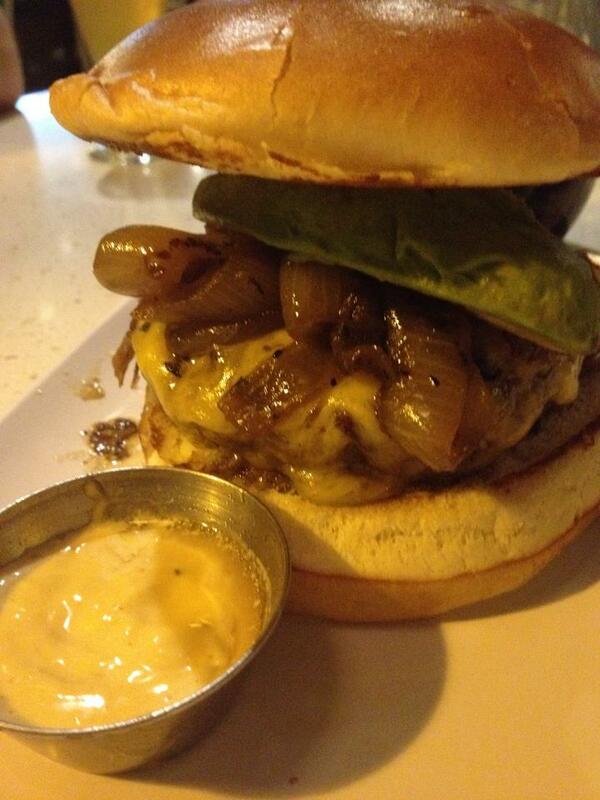 Behold the mighty burger. This is from The Counter in Los Angeles – where you can build your own, adding everything from grilled onions to black olives, shredded carrots and chipotle mayonaise…just for starters. 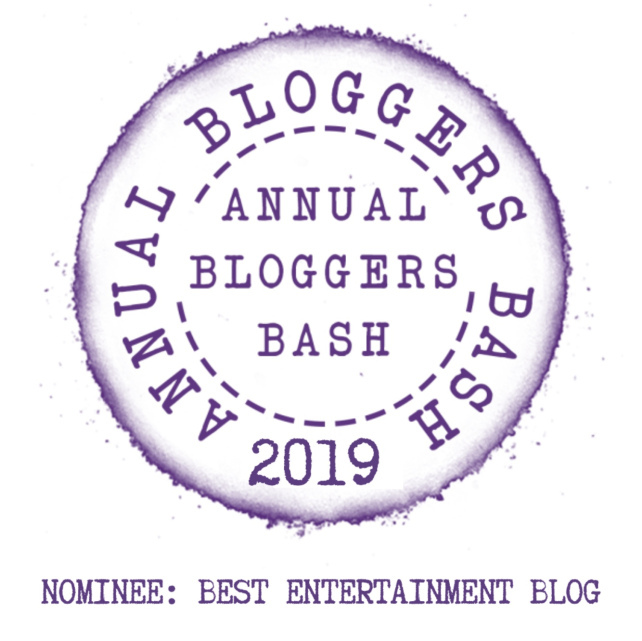 Trolling the internet today, I found the following examples of burgers gone wild – some old, some new – some attributable, some not – but all worth exploring! I found this picture…this is a really fun site all about food – of all kinds not just crazy stuff. 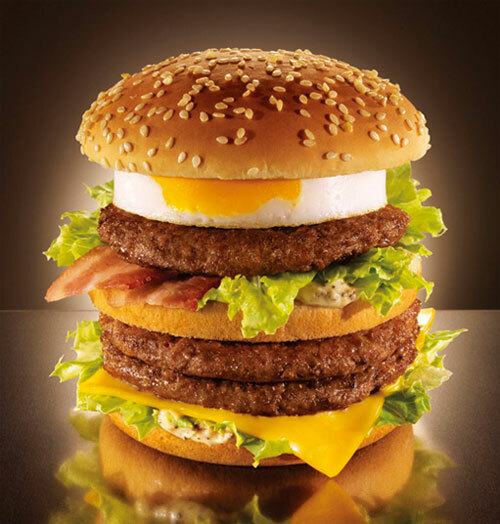 He has a great post on “fried pies”…but what drew me to it was the tamago burger, a McDonald’s creation being sold in Japan. 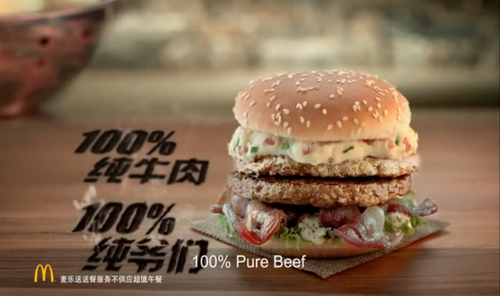 This is what McDonald’s is selling in China – their “chinese burger”, the unique aspect of this being that it is topped with mashed potatoes. 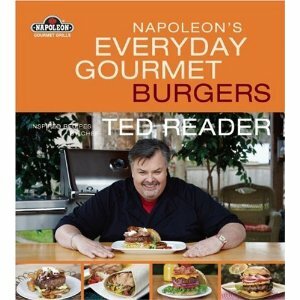 I’m all for that, as I like to put french fries on top of my burgers…is this any good? Go to China and let me know! As part of the publicity campaign for this book, Reader attempted to break a world record for the world’s largest hamburger. On May 8 in Toronto, Reader and 10 assistants cooked a 300-pound hamburger on a specially-made Napoleon Grill (it had a built-in hydraulic fork lift that flipped the burger during the cooking process). With bun and fixin’s, the final weight was 590 pounds, easily besting the standing record of 164.8 pounds. 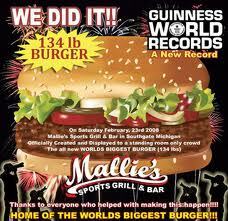 However, the Guinness Book of World Records states that the world’s largest hamburger must be commercially available (i.e., offered for sale publicly on a regular basis) and thus Guinness continues to list Mallie’s Sports Grill & Bar in Southgate, Mich., as the record holder, although Reader has said his behemoth will be made available on his catering menu. OK, let’s talk BIG! 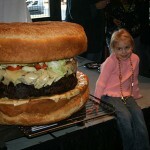 Mallie’s Sports Bar and Grill in Southgate, Michigan sells the world’s largest, commercially available hamburger, weighing approximately 185.6 pounds. 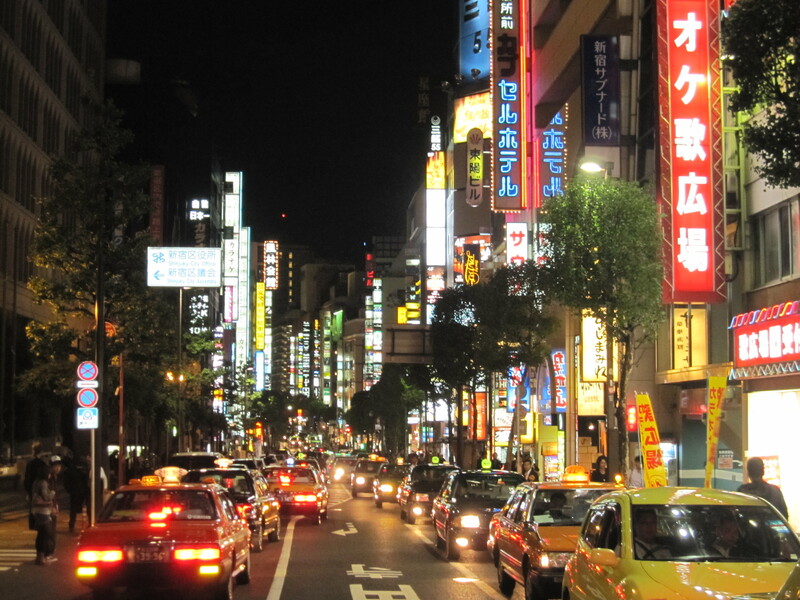 The restaurant advises that customers call at least 24 hours in advance, and can opt to have it delivered for US$2,000 or served in-store for US$399. 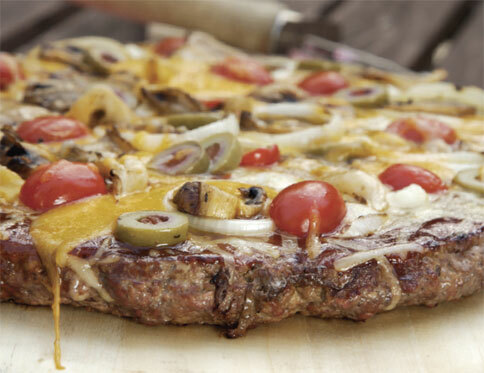 Named the “Absolutely Ridiculous Burger”, the hamburger takes approximately 12 hours to prepare and usually requires three people to flip the burger patty. This Burger weighs in at 185.6 lbs and requires 4 grown men to move it to the oven where it cooks for 14 hours.120 lbs of ground beef is placed between 2 custom made buns each weighing in at about 20lbs. When it’s finished cooking its topped with 30lbs of toppings including lettuce, tomatoes, cheese, onions, bacon and pickles. 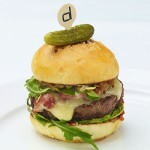 Here is another burger I found online, this one from DBGB Kitchen and Bar in New York. 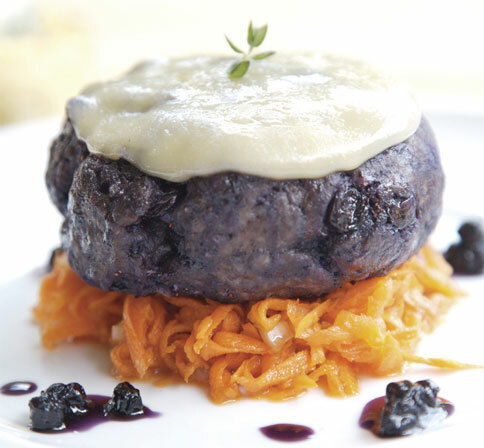 This burger is made with 3 blends of top quality beef; round, chuck roll, and chuck tender. Short rib is used to hold it all together. A 6 oz patty is grilled and topped with pork belly, arugula, sweet tomato-onion compote and Morbier cheese. Placed atop a butter brioche bun and served with cornichons, French Mustard and crispy fries. 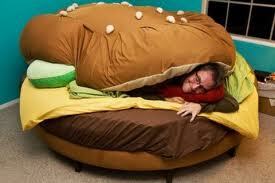 Cuddle up in your burger bed and dream of meat…goodnight! ‹ Celebrating Troma’s “Return To Nuke ’em High”! The “Tromatic” Classics Unveiled!